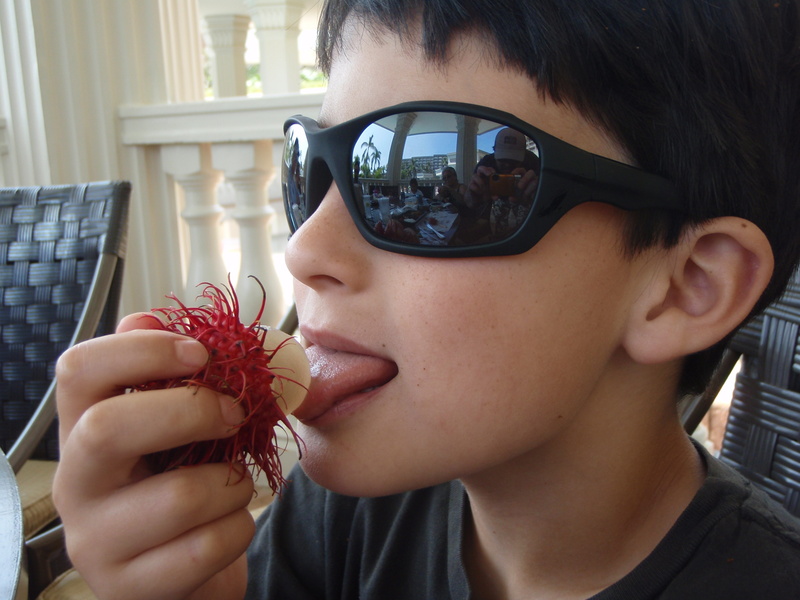 I guess I should say “foraging,” with quotation marks, because we “foraged” this rambutan up at the farmer’s market in Lihue, Kauai. Actually, Weston spotted them, and we got a whole bag for about five bucks. This is him going in for his first taste, which he enjoyed, although I think a lot of it had to do with the fruit’s outer skin, which looks like something from a science fiction movie. To me, the white, translucent fruit tastes a lot like a lychee nut–tropical and slightly floral, but relatively mild. Not bad, but not yet something I crave. At least not like smoky kalua pork stewed with cabbage. Or spam musubi. Or fried rice and eggs. Or any of the other delicious Hawaiian treats I know and love. Did I mention I gained 12 pounds in 12 days? And that’s the last of the tropical posts for this go around. We’ll now return you to your regularly scheduled, Pacific Northwest programming. Aloha!